Architect: J.C. Cady & Co.
J.C. Cady was the most talented architect in late-19th-century New York specializing in the design of Protestant (non-Episcopelian) churches. 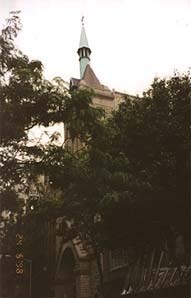 Cady worked extensively for Presbyterian and Methodist organization, but was also responsible for buildings erected by other Protestant congregations including this Swedish Lutheran church designed using the Romanesque forms that he favored. Cady's design is superbly adapted to the Lutheran church's midblock site. A bold stone tower capped by a pyramidal roof rises along the streetline, attracting the attention of people walking along Lexington and Third avenues. The eye is then drawn downward to the deep round-arched, pedimented entry portal that leads into the sanctuary. The Gustavus Adolphus Church, named for King Gustavus Adolphus of Sweden, was established in 1865.